Mgr Liberto conducting the Cappella Musicale Pontificia Sistina at St John`s Co-Cathedral. The Cappella Musicale Pontificia Sistina has just performed in Malta a number of concerts known as concerti straordinari because they are almost exclusively held in the Vatican. The concerts were given at St John's Co-Cathedral, in Valletta, on the invitation of Archbishop Joseph Mercieca and under the auspices of the Embassy of the Sovereign Military Order of Malta. 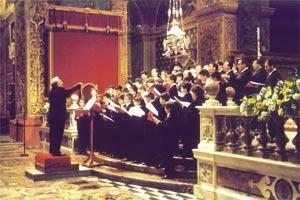 Other concerts were held at St Paul's Cathedral, Mdina, and at St George's Basilica, in Gozo. A reception in honour of Mgr Giuseppe Liberto, director of the Cappella Musicale Pontificia Sistina, was held at St John's Cavalier, in Valletta, seat of the Embassy of the Order in Malta. A symposium dealing with St Paul's Shipwreck and the Cult of St Paul on the Maltese Islands was held in Rabat under the patronage of the Embassy of the Order to mark the 25th anniversary of the Wignacourt Museum, in Rabat, and also to mark the Cappella Musicale's visit to Malta. Eminent Maltese and Italian speakers underlined the special ties between the Knights of Malta and the museum, founded by Grand Master Alof de Wignacourt. To further highlight the long-standing ties between the Order and Malta, a private concert by the Cappella Musicale Pontificia Sistina was held in the church of St Ursula, in Valletta, next to the monastery where the Jerosolimitan nuns reside. A special church candle, sent by Cardinal Pio Laghi, decorated with the emblem of the order to which the cloistered nuns belong, was presented to the Prioress, Sr Lucia Aquilina, by Don Joaquin Cotoner y Fuster, a descendant of the two Cotoner Grand Masters, in the presence of the Ambassador of the Order, Silvano Pedrollo, and the chaplain of the nunnery, Fr Gorg Aquilina.